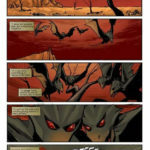 Amigo Comics is thrilled to announce that the first collection of their acclaimed miniseries PLANET OF DAEMONS is heading to the shops in May 2019! 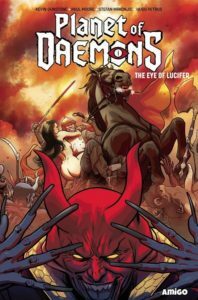 Described by one reviewer as “like a Hammer Horror film written by Neil Gaiman”, PLANET OF DAEMONS: THE EYE OF LUCIFER is a bewitching story of occult adventure created by the British duo of writer Kevin Gunstone (FUTURE PRIMITIVE) and artist Paul Moore (THE LAST HUNT). 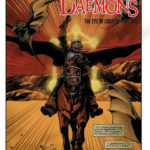 Set in the arcane realm of the Qliphoth and 17th century New England, Planet of Daemons follows the fortunes of Amos Deathridge, a former Puritan magistrate who now serves as jailer of the daemons and evil spirits who cast a sinister influence over mankind. Behind a stunning new cover by Hugo Petrus (WONDER WOMAN/JUSTICE LEAGUE OF AMERICA) and with an introduction by DC/Milestone artist Prentis Rollins (author of the Tor Books graphic novel THE FURNACE), Planet of Daemons collects all four issues of this spectacular miniseries of mystery, intrigue, and dark sorcery; and includes process pages, sketchbook and an afterword. 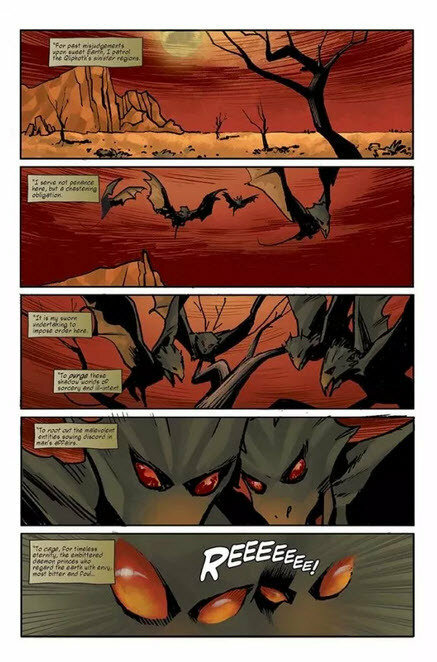 Written by Kevin Gunstone, art by Paul Moore, and colored by Stefan Mrkonjic (FUTURE PRIMITIVE) with lettering by Malaka Studios. The collection ships in May 2019 and is solicited in the March edition of Previews. 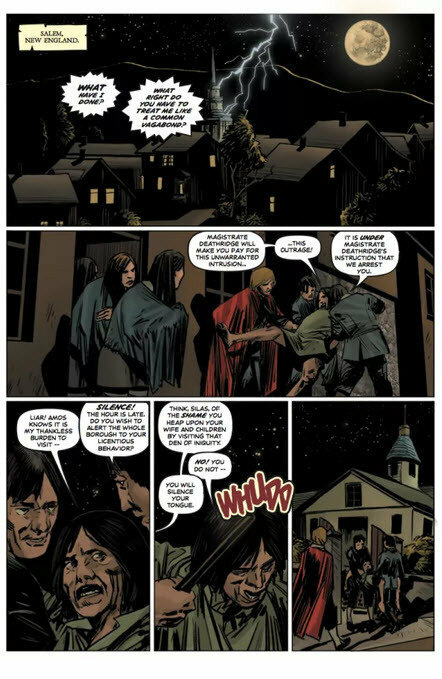 “Planet of Daemons is just the kind of comic I love to read. Paul’s beautiful, classic style is a perfect unholy marriage to Kevin’s wild story. 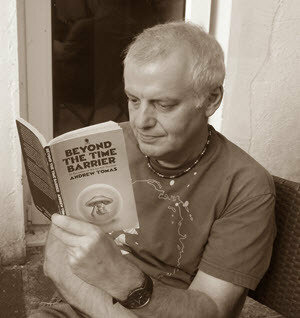 Highly recommended!” – Matt Smith, Barbarian Lord. “Dark Cabalistic secrets lurk behind every page of this violent, enigmatic story of an anti-hero who embraces damnation, so the world will be spared from his fate.” – Jasper Bark, writer, Bloodfellas, Parassassin and Quiet Places. 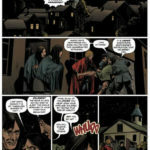 “In Planet of Daemons, Gunstone and Moore have crafted a thrilling and intriguing tale filled with both wonder and dread. 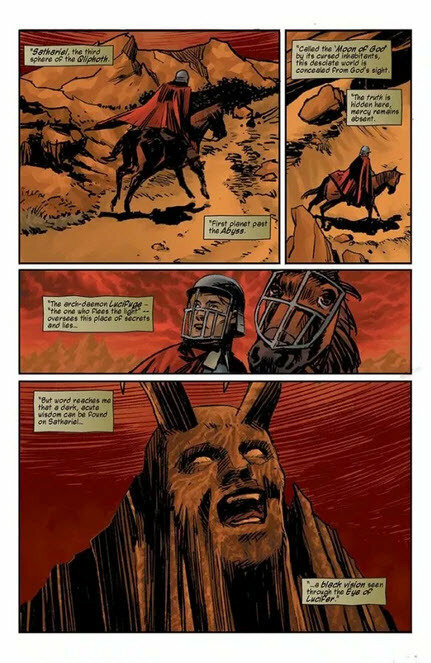 A fantastic comic indeed.” – Dan Butcher. 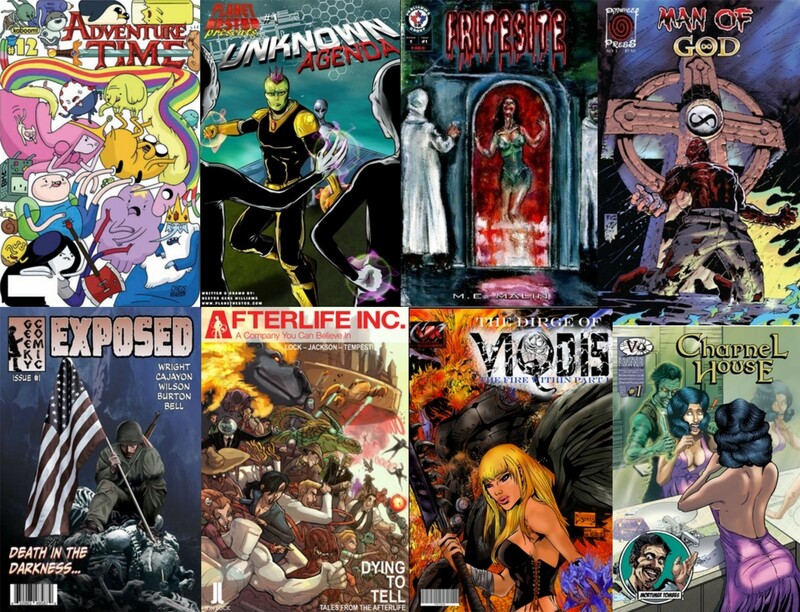 Vanguard, Awesome Comics Podcast. Kevin Gunstone is a Brighton-based comicbook writer from the UK. 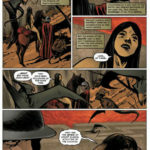 In the past he has written series for both Marvel and Image Comics, among others, and 2016 saw the release of his imaginative and spectacular stonepunk epic Future Primitive, published by Markosia, in collaboration with the Serbian artist Slobodan Jovanovic. 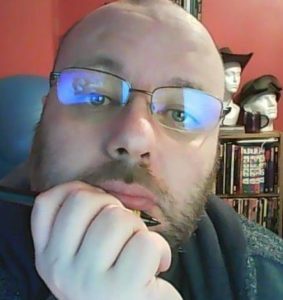 Kevin is also a visiting lecturer on the Cartoon and Comics Art degree course at Staffordshire University, and when not writing likes to DJ House tunes occasionally. Born in Šabac (Serbia) on 06. 06. 1985, Stefan attended School of Applied Arts in Šabac and later the Academy of Arts in Slobomir where he graduated in 2010 as a Graphic Designer/ Illustrator. 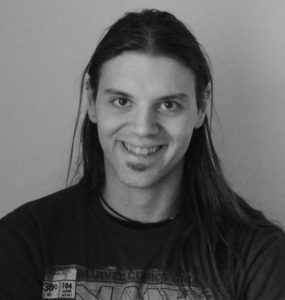 He published his first comic book in the EON Magazine in 2005. Since then he’s produced short comics and illustrations for various Serbian SF/ Horror magazines like Emitor, Raketla and Omaja. 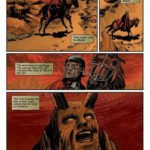 As a colorist Stefan has collaborated with artist Slobodan Jovanovic (Šumar, Milost and Future Primitive), provided colors for Alberto Veloso and Brian Gillman’s comic Parallel P.D. and colored covers for Zoran Jankovic (The Fallen). 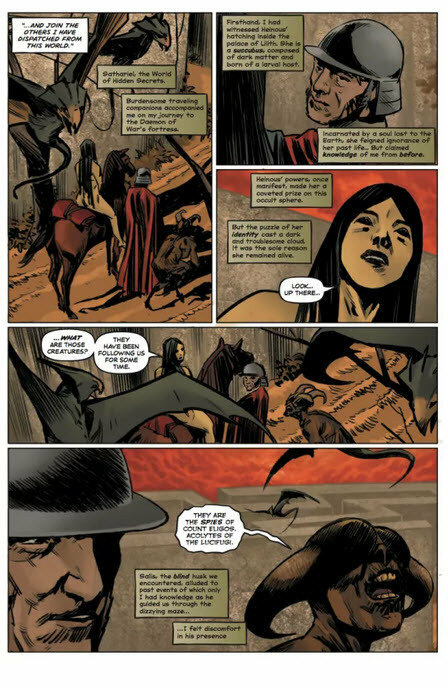 Planet of Daemons is his second collaboration with writer Kevin Gunstone. 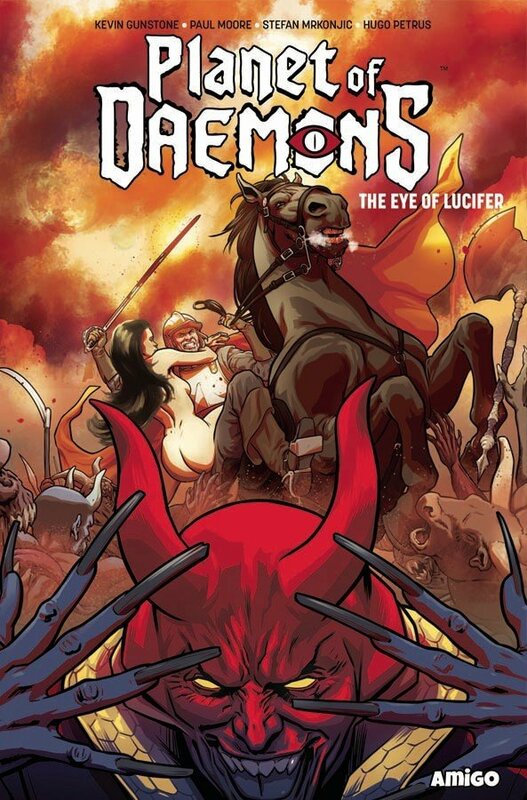 Tags: Amigo Comics, Amos Deathridge of 17th Century New England!, Dreaded Labyrinths!, El Torres, First Collections!, Future Primitive, Hugo Petrus, Indie News, Kevin Gunstone, Malaka Studios, May 2019 release!, Paul Moore, Planet of Daemons, Planet of Daemons: Eye of Lucifer to be featured in March edition of Previews!, Planet of Daemons: The Eye of Lucifer, Prentis Rollins, Reincarnated Souls!, Sathariel, Small Press Happenings, Succubus Queens, The Arcane Realm of Qliphoth, The Last Hunt, Tor Books/The Furnace, Wonderful Dread and Occult Action In Planet Of Daemons Mixed Together Just Right!